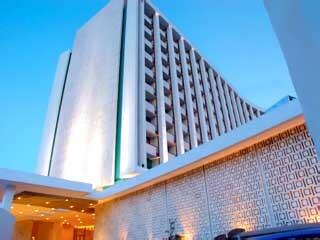 Athens Hilton first opened in 1963 and fully refurbished between 2002 and 2003. 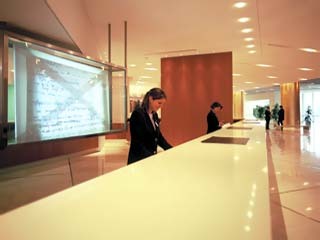 It is a deluxe Class Hotel in the center of Athens city and it is the official Headquarter hotel for the International Olympic Games. This is an honor as Athens welcomes the games back after more than a century. Spacious, stylish and modern spaces, resplendent with natural light, provide you with an unparalleled environment in which to work or relax. From the showcased works of art, to the fabulous panoramic city rooftop views through to the coolness of the hotel pool and gardens: Relax ...and enjoy. No details available at the moment. Please check back later. 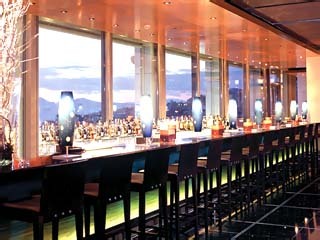 The Oasis Bar: Situated near the pool, it is the ideal spot for a refreshing break from the hot summer days. Serving light meals, salads, ice-creams, all beverages and fruit cocktails in a garden like environment. Byzantine Restaurant: All-day casual international Restaurant offering sumptuous buffet breakfast, an equally appetizing lunch and dinner with Mediterranean and Greek cuisine, as well as specialized theme nights. Italian, Argentinean, Asian, and Sunday brunch for family gatherings. Milos: One of Athens' most upscale Restaurants operating from September to May with an emphasis on fresh fish and seafood from the Greek seas with an excellent wine selection. 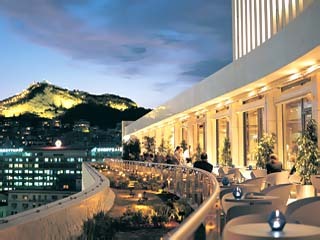 Galaxy Bar: Juicy steaks, fresh fish and crispy salads on the Galaxy Terrace on the top floor giving the best view of Athens. Aethrion Lounge - Art Cafe: The city's meeting spot with a variety of coffees, cocktails, light snacks and home-made pastries in the surroundings of regular art exhibitions. In each of the 524 modern and spacious guestrooms and suites, the emphasis is on elegance and comfort. 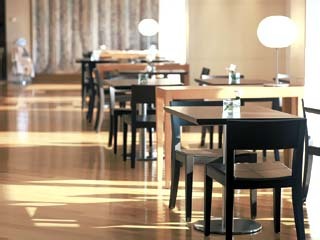 Athens Hilton is the only hotel in town with 179 rooms facing Acropolis. The rest have views either facing Lycabettus Hill or Hymettus mountain. The majority of the rooms have their own panoramic balcony. 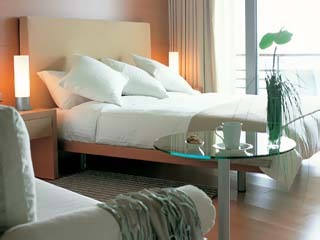 The suites are 18 and the Presidential Suite is 220m2, with a Jacuzzi tub looking out to the Acropolis. 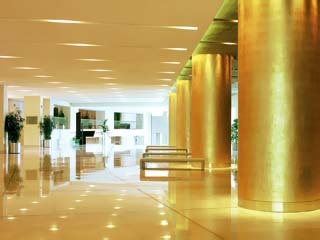 The Athens Hilton faces the famous ancient monument of Acropolis, situated in one of the city's most fashionable avenues. The Hotel is located close to the City's Center, opposite the national Art Gallery and within walking distance of companies, shopping centers and embassies. You can visit Kolonaki's trendy boutiques and unfold Greece's history in the nearby Benaki and Cycladic museums. 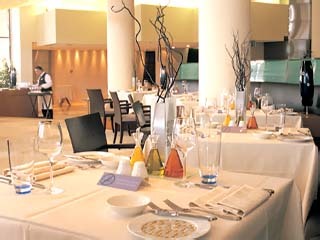 Nearby are also the Athens Concert Hall and the main shopping district, Plaka square. 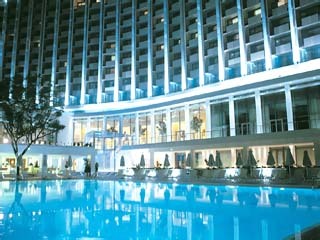 Open All Year (except 5 - 31 August & 4 - 10 October 2004)... Athens Hilton first opened in 1963 and fully refurbished between 2002 and 2003. It is a deluxe Class Hotel in the center of Athens city and it is the official Headquarter hotel for the International Olympic Games.